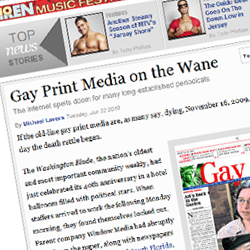 With Planetout and Gay.com possibly saved by its merger with Regent Media (who bought up The Advocate and Out some time ago), more bad news its the gay news-media industry. The investment fund that owns the Washington Blade, the Southern Voice, Genre magazine, and other gay publications has been forced into receivership by the federal Small Business Administration (SBA), which will sell the fund’s assets and distribute the proceeds to investors. “As a consequence of defendant’s continuing violation… SBA is entitled to the injunctive relief… including the appointment of SBA as receiver of [the Avalon Equity Fund],” the SBA wrote in an August 2008 court filing, which was only recently found by Gay City News. Avalon, which owns a stake in the company that publishes the New York Blade and HX, was licensed by the SBA as a small business investment company (SBIC) in 2000. Through 2007, it borrowed just over $38 million from the federal agency to invest in gay media properties and a range of other ventures. As part of its contract with the SBA, Avalon was required to have private money or assets in the fund from sources, such as individual investors, that had a value equal to half the amount it borrowed from the SBA or just over $19 million. In 2007, the SBA wrote Avalon that it had a “condition of capital impairment” because the value of its private assets had fallen below the required level. Read more of the story at Gay City News, including the closed lips of Window Media officials (I don’t blame them). Rumor is several gay newspapers have folded over the past year, although I haven’t been able to get an accurate list of them. This isn’t even to mention the fact that I’ve never been able to find an accurate, up-to-date and comprehensive list of all gay newspapers in the U.S. to begin with. Newspapers were already in a downward spiral before this economic mess. Here’s to hoping we can all hold on until things get better and finally find a way to survive in a new media world. Having researched the SBA and its practices, I know that receivership means that the company has an opportunity to reorganize and preserve assets with an invested officer at the helm. I believe that is what is happening in this situation, and the doom and gloom piece seems to be a bit dramatic. All media companies are in essence in receivership and in search of one buyer to take over the entire portfolio. Why else would this group have put together so many of those titles you listed? The economy dictates, and no matter who is running the company, given today’s economy, it is obvious that the portfolio and all its entities will be business as usual for at least the next few years, when the market rebounds and can support a large network buy, such as this would require.